We spoke to Yvonne about the project, the challenges of working on a tight budget for a social enterprise, and what they learned through the process. What’s your architecture specialty and why were you drawn to work with Free to Feed? We aren't bound to a particular typology but we try to take a collaborative approach to design. Amber and I like to work closely with people to make sure their project reflects them well. I was drawn to Free to Feed because Loretta and Dan have such a passion for their work, and it's really infectious. What attracted me most were the initiatives do with refugees and new migrants. Being the child of migrants myself, I remember seeing how difficult it was for my parents in the 80's to make sense of a new country and navigate work. I love that an organisation like Free to Feed exists to empower, provide entrepreneurial support and help people have agency in what they do within a community. What was the brief for the fitout and what mood/vibe were you aiming for? 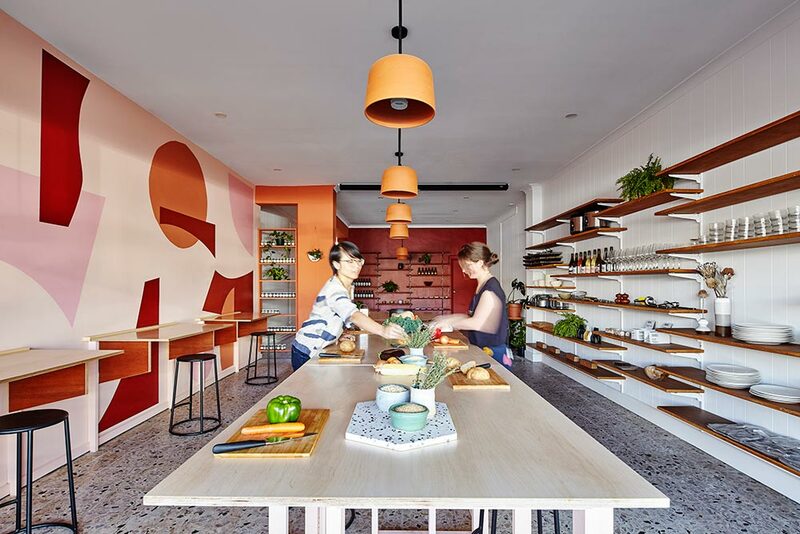 The brief was to create a space which could be used in a variety of ways from sit down dinners, casual lunches, displaying and selling spices, presentations, workshops, cooking classes and more. It also had to be able to be packed away when needed, and there needed to be enough flexibility for the space to evolve as Free to Feed grows. For this, we designed modular trestle-style benches and fold-down tables which can be cleared out of the way or re-arranged as needed. Keeping the cooking classes in mind, we needed to bring power to the centre of the space. To do this neatly we adapted some light fittings to hold power points instead of globes so they were practical as well as decorative. When we sat down to discuss the mood and vibes we were hoping to achieve, we were drawn to this one particular image on our shared Pinterest board of a spice market with lovely earthy tones, pinks, and terracottas. This became the basis for the palette which ran through the interior and the aim was to create a workspace which was warm, bright and also a bit playful. What strategies did you employ to get the most out of a social enterprise budget? Free to Feed were lucky to have received some very generous donations from people who believed in their work. Anchor Ceramics provided 10 terracotta pendant fittings, and Spencer Harrison painted the mural on the wall. Without these, the space as it is would not have been possible. 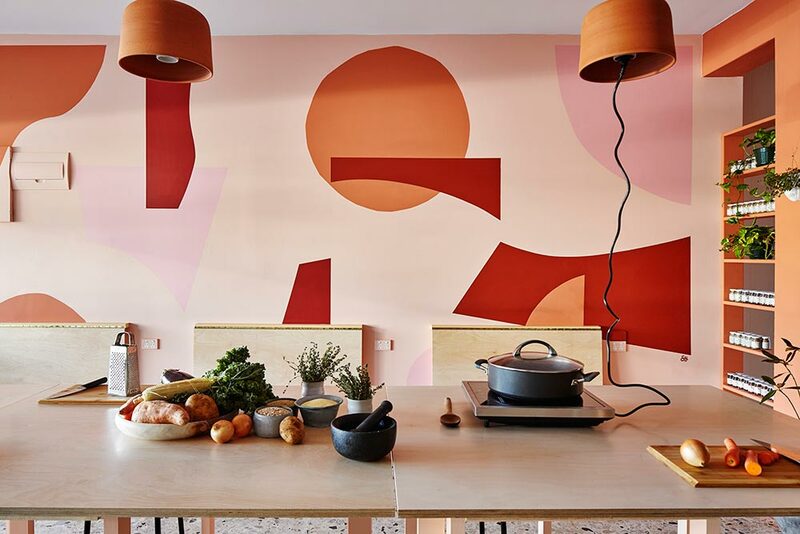 We needed bang for buck for this project and paint is such a great cost-effective way to transform a space, so to help differentiate zones we used blocks of colour on the walls which picked up on the colours in the mural and light fittings. The benches are cut from full off-the-shelf sheets of ply and dimensioned so that there was minimal cutting required and no offcuts. Unless it was absolutely necessary, we tried not to move any plumbing, gas, and electrical and we repaired the wall linings instead of ripping them off. 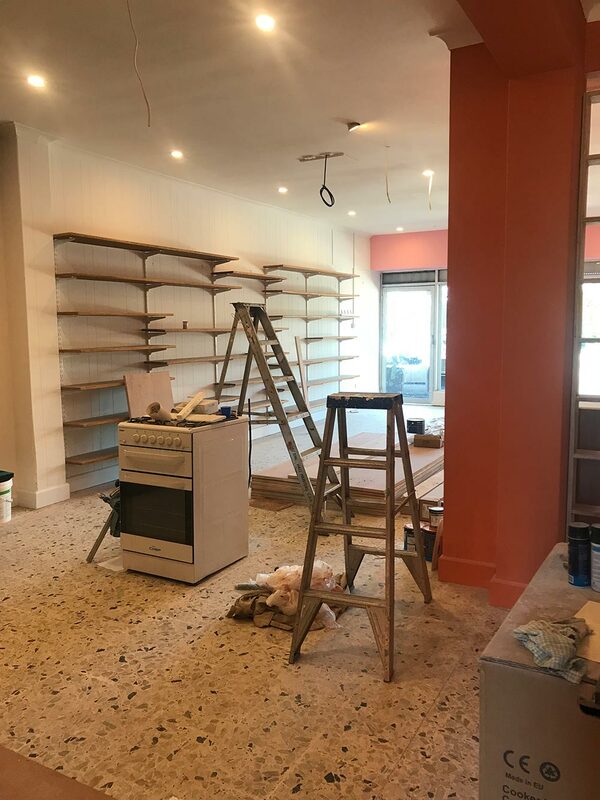 Luckily for us, underneath the laminated floor of the original shop was a fabulous terrazzo flooring which was still in good nick. Were there any special considerations/challenges? Time was a challenge on this one. There was a very short period to get the design and drawings done, appoint builders and then get the thing actually built. The builders, Ampson Developments, programmed the works really well and kept things going at lightning speed to hit the completion date. From our side, we issued general drawings at the beginning - enough to get a quote on and get started - and then developed details simultaneously as construction occurred to save on time. Projects like these really make you appreciate the value of having a good collaborative team who are communicative and on the same page. The finished space did differ a little from the original concept as things had to fall away or change, but that's normal for any project! It reached completion just in the nick of time - the day after the builders moved out was the first dinner event. What did you learn through the process? You don't need need to make drastic structural changes to make a statement when working with existing buildings. Work with the bones that you've got - do little, but do it well. You can achieve a lot with a small budget that way! 'Before' photos by Yvonne. 'After' photos by fellow CWC Member, Jade Cantwell.